The Club's kit shop is now open again for you to order the Club's shirts, shorts, hoodies etc. It will close on February 17th and no late orders can be accepted as after this date the shop is no longer accessible from our website. This order window has been scheduled to allow for delivery in mid April, so any kit required for Regionals must be ordered before the window closes. Please note that you need to be fully logged into the Swan website to be able to access the kit shop. If you haven't purchased kit before you will need to set up an account once in the shop to be able to see the prices and place your order. This is very simple to do. The kit shop is the first item in the drop-down menu under the Information tab on our website. If you would like your shirts, hoodies or jackets personalised (which makes them much easier to return when they get left poolside) this is easily requested via the order form but we ask, as with the named hats, for first name and surname to be used (or initials only on the jackets) and no nicknames please. 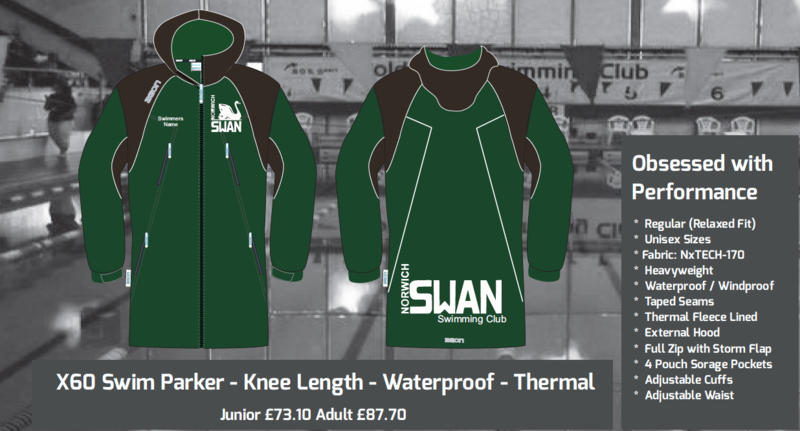 There are no samples of kit to try for size but most items have now been purchased across the Club and I'm sure that swimmers won't mind their colleagues trying theirs for size. A new addition to our kit for 2019 is the Swim Parka. Zeon Swim Parkas are a waterproof thermal long coat - ideal for wearing to winter early morning training or late journeys home after evening sessions and for wearing lakeside at open water swimming which starts in May. Zeon say they are thicker than a Dryrobe but if it's required to be used as a 'personal changing room' then a larger size would need to be ordered! I am expecting some samples of the Swim Parka, if you would like to see one before buying then please contact me. When I receive the bulk club order you will need to collect your items from me, usually at one of the pools my swimmers are training at. Kit is not given out by coaches. Details of where you can collect from will be given when you are notified we have received the delivery. Prompt collection is appreciated. Any queries please email me or catch me poolside. One request though; please don't leave ordering until the last minute as any problems or queries may take a day or two to sort.